Decision making is the act of making a choice among the alternatives. There are innumerable decisions that are taken by human beings in day-to-day-life. Decision Making is possible when there are two or more alternatives to solve a single problem or difficulty. Therefore, decision making is a problem-solving approach by choosing a specific course of action among various alternatives. Identification of assets in which investment is to be made is called investment decisions. Generally, the assets of a company are of two types – those which yield income spreading over a year or more and assets which are easily convertible into cash within a short time, such as inventory & receivables. The first type of investment decision is capital budgeting and the second one is the working capital management. Capital budgeting is the allocation of funds on a new asset or reallocation of capital when an old asset becomes non – usable. It also deals with the options of make, buy or lease. Capital budgeting decision seeks to determine the benchmark or standard against which benefits are to be judged. This is known as cut off rate, hurdle rate, minimum rate of return etc. which essentially is cost of capital. Working capital management relates to management of the current assets & current liabilities and is also termed s liquidity management. The decision relates to how, when and where funds are to be raised to meet the investment needs. It is related to the capital structure or financial leverage or dent – equity ratio. The right mix of debt and equity enhances the overall shareholder’s wealth. There are no common standard applicable to all industries but a debt equity ratio of 2:1 is considered reasonable by the lenders. 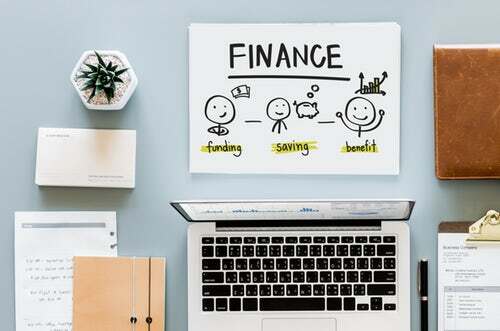 The financing decision aims to determine the right balance between debt and equity considering the factors like the industry, the ability to raise debt, the relative cost of debt & equity and the borrower’s ability to service debt. Besides managing financial leverage, financing decision should address issues of short term and long-term sources of funds & matching with the utilization for the same period. The profit of the company can be dealt with in two alternate ways – to distribute as dividend to shareholders or to retain them in business. If the profits, are distributed to the maximum extent, the company will lose out on important source of internal financing. The company can form a dividend policy specifying the payout ratio and reinvested it’s retained earnings. The above-mentioned decisions might not be the exhaustive ones but indicate the kind of decisions to be taken by financial managers of a company. Once again, the primary objective of such decisions is to maximize the wealth of the stakeholders through detailed analysis of the project. The Net Present Value (NPV) takes into account the cash outflows and expected cash inflows for the analysis of the feasibility of the project. In this method, the present value of cash outflows is subtracted from the present value of cash inflows. This enables the manager to understand the value created for the shareholders of the company, if the project is undertaken. The net present value approach is the most intuitive and accurate valuation approach to capital budgeting problems. Discounting the after-tax cash flows by the Weighted Average Cost of Capital (WACC) allows managers to determine whether the project will be profitable or not. Some of the major advantages of the NPV approach include the overall usefulness and easy understandability of the figure. NPV provides a direct measure of incremental cash flow, allowing one to compare multiple mutually exclusive projects. The decision rule for the NPV method is that “Accept the project that has a positive NPV and reject the project that has a negative NPV”. This is because any positive amount will create wealth for the shareholders whereas a negative amount will erode the wealth of the shareholders. Internal Rate of Return (IRR) is the discount rate often used in capital budgeting that makes the present value of all cash flows from a particular project equal to zero. Generally, the higher a project’s internal rate of return, the more desirable it is to undertake the project. As such, IRR can be used to rank several prospective projects a firm is considering. Assuming all other factors are equal among the various projects, the project with the highest IRR would probably be considered the best and undertaken first. IRR can also be interpreted as the rate at which the present value of the cash outflows equals the present value of cash inflows. IRR can be thought of as the return that the project would generate for the company if it is undertaken. IRR of a project can also be compared against the prevailing rates in the financial market, because if IRR of the project is equal to or less than the return in the market, the company may choose to invest in financial markets rather than take on a project providing same return. If IRR of the project is higher than the required rate of return of the project, it should be accepted or undertaken. IRR is calculated using iteration method by keeping cash outflows on one side of the equation and cash inflows on the other side or alternatively scientific calculators and excel workbooks could easily calculated IRR. A Profitability Index attempts to identify the relationship between the costs and benefits of the proposed project. The profitability index is calculated by the present value of projects future cash flows by the initial investment. A PI greater than 1.0 indicates the positive profitability of the project and a PI less than 1.0 indicates negative profitability of the project. As the values on profitability index increase so does the financial attractiveness of the project. A ratio of 1.0 is the lowest acceptable measure for the profitability index. Any value lower than 1.0 would indicate the project’s PV is less than the initial investment, and the project should be rejected or abandoned. The profitability index rule states that the ratio must be greater than 1.0 for the project to proceed. The interpretation of payback period is used to judge as to how early will the initial investment made by the manager comes back to him. Therefore, the shorter the payback period, the better it is for the investor. When the projects are compared, the project that has the shortest payback period is the project to be accepted. A major drawback of the Payback Period method is that it doesn’t take into account the time value of money which in turn is vital for financial decision making. A discounted payback period gives the number of years it takes to breakeven from undertaking the intial investment, by discounting future cash flows and recognizing the time value of money. The Net Present Value (NPV) aspect of the discounted payback period does not exist in a payback period in which the gross inflow of future cash flows is not discounted. Discounted payback period addresses a major drawback of the Payback Period method. The payback period is the amount of time for a project to break even in cash collections. Alternatively, the discounted payback period reflects the amount of time necessary to breakeven in a project based on not only on what cash flows occur, but when they occur and prevailing rates in the market. 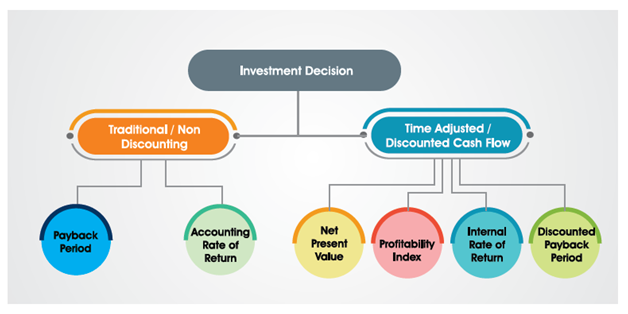 Decision matrix similar to payback period is applicable in case of DPP. Net Profit Margin: Helps to interpret the actual profitability of business, after paying off all the other stakeholders such as dividends, interest etc. This ratio measures the operating efficiency of the business. Asset Turnover Ratio: This helps in analyzing how well the company has been using its assets to generate revenue. This ratio measures the Asset use efficiency of the business. Equity Multiplier: This ratio assesses the financial leverage of the company. Equity multiplier indicates whether the company finances majority of its assets through debt or equity. Higher the equity multiplier, the more leverages the company, or the more debt it has in relation to its assets. As an extension of DuPont Analysis, each of the above three elements can be sub broken into a large number of ratios to analyze financial efficiency (or inefficiency) at smaller activity level for corrective action or financial decision making. Decision making in financial management is supported by historical data analysis, projections and use of ratios and tools. As a thumb rule, any tool which doesn’t factor in time value of money, needs to be discarded for the purpose of evaluation. The financial manager has to have a high level of judgement while applying the tools.